Computer Rage Video Slot Guide & Review - Casino Answers! Computer Rage is a 5-reel, 25-line video slot developed by Cryptologic, featuring a wild substitute symbol, scatter wins and two bonus games. You can play the Computer Rage video slot game at InterCasino and Casino Joy. Bets on the Computer Rage slot machine are $0.01, $0.02, $0.03, $0.04, $0.05, $0.10, $0.15, $0.20, $0.25, $0.50, $0.75 and every dollar up to $20. You can bet from 1-25 paylines per spin. Computer Rage is a penny slot, thus you can bet as little as one cent per spin. Computer Rage has a very large betting range with the maximum total bet being $500, thus it is great for all types of slots players from low stakes to high stakes players. 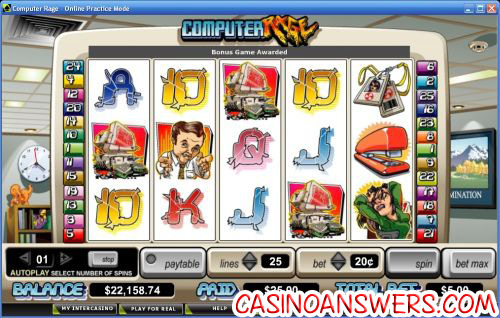 To play the Computer Rage online slot, hit the “Spin” button or “Bet Max” to play all 25 lines. The highest paying symbol on the Computer Rage video slot is the Boss symbol. The Boss symbol seems to be based on Ricky Gervais from the UK version of The Office. If you hit 5 Boss symbols on a selected payline on the Computer Rage video slot, you will win the 5000 coin top jackpot. The Boss symbol is wild and will substitute for all symbols except for the Girl and Scattered Computer symbols. Another high paying symbol on the Computer Rage video slot is the Stapler, which can pay out up to 1500 coins. To try and win one of these great payouts, you can play the Computer Rage bonus game at InterCasino! The scatter symbol on the Computer Rage slot machine is the Computer symbol. 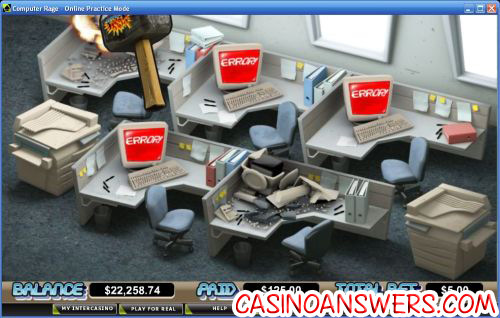 If you 2, 3, 4 or 5 Scattered Computers land on the reels of Computer Rage, you will win 2X, 5X, 10X or 100X your total bet. When the Boss symbol lands on the first reel at the same time as the Frustrated Girl symbol appears on reels 4 and 5, you will trigger the Computer Rage bonus game. In the bonus game, you will get to choose 5 of 10 windows. When a computer if pushed out of a window you choose, you will win a prize. This feature is not triggered as often as the Smashed Computer bonus game, but when we were able to get it, we were able to win $105. Wins from the Computer Rage feature are added to payline and scatter wins. Computer Rage has an autoplay mode located in the bottom left corner. You can select up to 99 autoplay spins. To start the autoplay mode, hit the “Spin” or “Bet Max” buttons as you would to normally play Computer Rage. To stop the autoplay mode, hit the “Stop” button in the autoplay section of the game buttons. Payouts are made according to the Paytable. Payline wins are multiplied by the bet per line. Highest win amount is paid on each selected payline. Scatter wins are multiplied by the total bet and added to payline wins. Feature wins are added to scatter and payline wins. Win combinations pay from left to right only except for the Girl and Scattered Computer symbols. The Boss symbol will substitute for all symbols except for the Girl and Scattered Computer symbols. The Gurl symbol appears on reels 4 and 5 only. Computer Rage offers a theme that many slots players can relate to. In addition to that, there are two bonus games that can both lead to some large wins. If you’re looking for the right online casino to play the Computer Rage video slot at, we recommend you sign up and make a first deposit at InterCasino! Is the Computer Rage video slot USA-friendly? Where can I find a Flash game of the Computer Rage slot game? If you want to play the Computer Rage video slot in your browser, you can play the Computer Rage Flash game at the InterCasino and Casino Joy Flash casinos. You can play for real money only. If you have any problems with the Flash casino software, make sure you have the latest version of Adobe Flash Player installed on your computer.